Leslie Mackie ‘s Baked Yogurt Tart was one that I was rooting for in this month’s recipe nominations. The combination of fruit and yogurt in a pie crust sounded pretty good to me! Instead of using berries for my tart, I pitted some of the sweet cherries I got from my CSA. I see now that I could have squeezed lots more cherries in there…I’ll keep that in mind when I make this again (which may be for this weekend’s BBQ with the in-laws). Also, I left the chopped almonds off my tart and added in a little almond extract instead. The recipe says to bake it till brown on top. Mine took the full baking time but was nowhere near golden brown afterwards. I didn’t want to overbake it and since I could tell the custard was set, I just went ahead and took it out. When cut, this tart held its shape and reminded me of a cheesecake. I actually thought the filling could be a tad softer– I’m not sure if it was the thick Greek yogurt I used, or if the amount of flour used to thicken the filling could be reduced a bit (3/4 cup is a lot of flour!). I may fiddle with a couple of things next time I make this, but, all in all, it’s a tasty spin on a summer fruit tart. We’re going without hosts now for TWD, so for the recipe see Baking with Julia by Dorie Greenspan (it’s also here, and there’s a video, too). Don’t forget to check out the rest of the TWD Blogroll! That looks great! I think that the addition of the almond with the cherries was a great idea and would have given the filling a beautiful flavour. Good choice with the cherries…they’ve been so sweet and wonderful this year!!! This was a great selection, and it looks delicious with cherries. I used regular nonfat yogurt and the filling was still pretty thick, so a little less flour might be in order. Looks picture perfect and delicious, too! Love the cherry and almond flavors…great combo! Cherries would be so good! Great choice. It looks wonderful. I liked this tart a lot. Loved the consistency of the baked yogurt…like a cheesecake, but not rich and heavy. I think it is a great summer time dessert with fresh fruit. It’s definitely thicker with greek yogurt. I used to make it without way back when greek yogurt was not popular. Looks good. I bet the cherries were terrific. 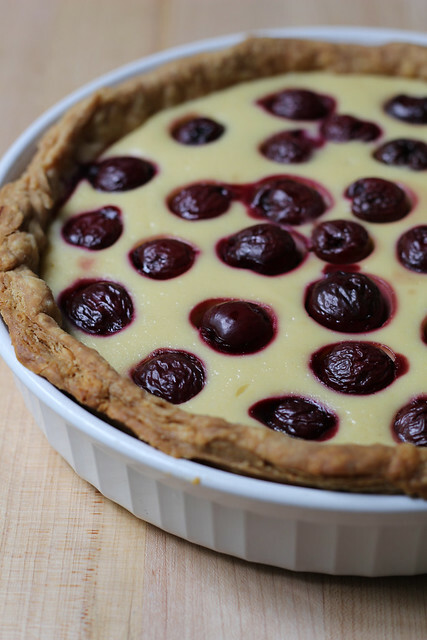 Your cherry tart looks great! I made mine with plain whole milk yogurt, and it was still pretty thick. (of course, I overbaked mine trying to get the “golden brown”) Even so, we ate the whole thing. I’ll be making it again when peaches are in season later this month. What a perfect summer treat! I can’t wait to try this! I love cherries! Looks delicious! Mine was thick as well, I was thinking it would be silkier and creamier. Cherries! Yum!! I used peaches and added almond extract to the filling. I also sprinkled sliced almonds on top. It was yummy! I am so making this, it looks so pretty and summery. Gorgeous! this looks AMAZING! I’m trying it asap! 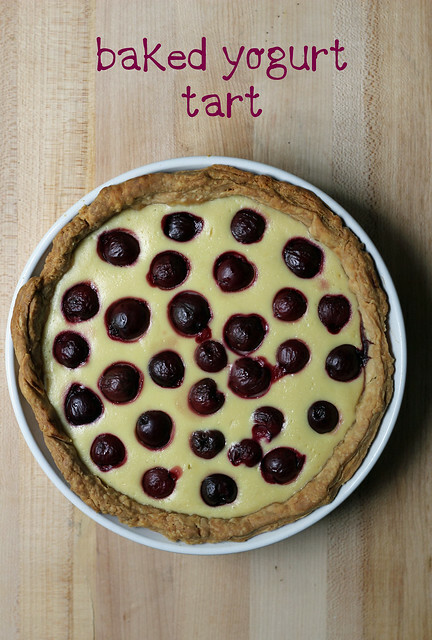 it’s sleeker and less dense than the yogurt tart, and the crust is great. I made it several times over the summer to go with fruit sauces, and have been meaning to post it forever. if you can’t buy labni where you live, you can make it by straining full-fat or 2% greek yogurt in a cheesecloth-lined strainer overnight.